Experience three up-and-coming distilleries for what’s next in bourbon, whiskey and beyond. 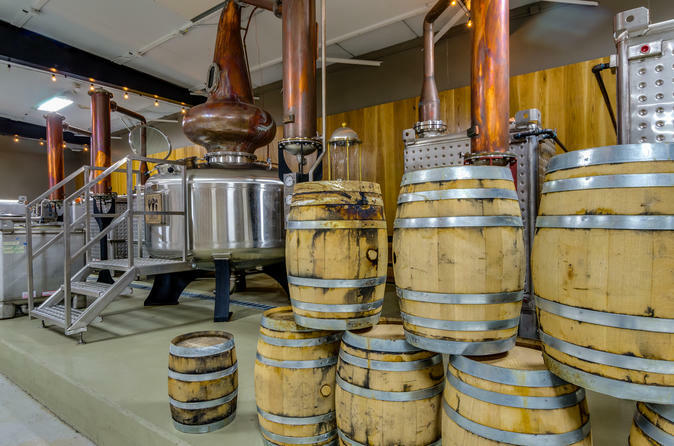 This immersive spirits adventure to Corsair, H Clark and Leiper’s Fork includes a cocktail experience at Corsair, lunch, guided transportation, and three distillery tours with tastings. Your day is planned from start to finish so you can dive into Nashville’s rising distilling scene. We take care of the reservations, admissions, timing and itinerary so you can sit back and relax. We know that you’ll make lifelong memories you can’t wait to share. Travelers can search for their new favorite drink hopping to multiple Tennessee distillers in one day. From innovative techniques to farm-to-bottle ingredients, each stop shows a new distillery’s passion for craft spirits and a unique approach to distilling. Your tour departs from the Omni Hotel in downtown Nashville and visits three regional Tennessee Whiskey Trail distilleries. You'll gain expert insight, fun facts, and more Whiskey 101 from your guide in between destinations. You'll travel to Corsair, where childhood friends and former brewers began distilling their innovative products just over 10 years ago. Now nationally renowned, their Nashville-made whiskey, bourbon and other artisan spirits play with hundreds of mash bills, unusual grains and an array of experimental techniques. Also, see Thompson’s Station’s H Clark Distillery, which is new to the spirits scene, but its four-grain bourbon, gin and experimental micro batch distillates are already making a name for themselves. By utilizing locally grown grains and distilling only 100 gallons at a time, you’ll see how alcohol is made on a small scale. Finally, its charming 200-year-old log cabin tasting room and stories of corn grown on the family farm has made Leiper’s Fork Distillery in Franklin a popular tour stop. Taste their small batch whiskey filtered through four feet of local sugar maple wood charcoal and other premium southern spirits.